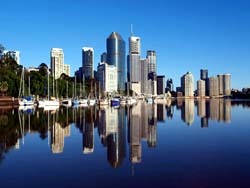 The presented room availability, rates and discounts are actual and final for all our 213 hotels in Brisbane. Brisbane is a paradise for fans of outdoor activities. Tourists are welcome to visit a huge number of different types of entertainment, staring from biking and outdoor recreation, to visiting elite clubs and bars. Mountain Coot-tha is a popular place of unhurried rest among travelers. Here visitors can climb to the top of the mountain, examining the local natural attractions along the way. When the climb is over, they will surely enjoy the magnificent panorama of the city. There is also a beautiful botanical garden, which attracts visitors by its rich collection of rare plants and flowers. A walk to Scenic Rim mountain region is one more wonderful way to see the inhabitants of the local flora and fauna. Fans of cycling will be glad to see special cycling roads, but visitors are surely welcome to make a walk the scenic landscapes. Vacationers with children will be interested in visiting the local Lone Pine Koala Sanctuary Zoo, the main inhabitants of which are friendly koalas. Here you are able not only watch friendly bear cubs, but also participate in their feeding. Visitors can even stroke cute animals and make a memorable photo.